At Extreme Rules, Bayley will challenge Alexa Bliss for the Raw Women’s Title in a Kendo Stick on a Pole Match. 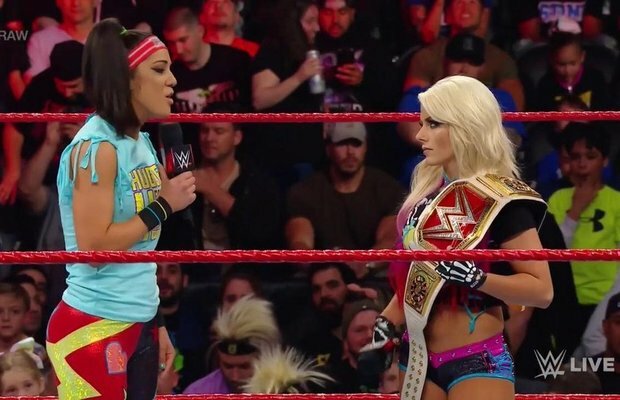 During tonight’s Monday Night Raw, Bayley interrupted Alexa Bliss’ in-ring promo to announce that she was invoking her rematch clause to take on Alexa at Extreme Rules. Alexa didn’t take to kindly to Bayley’s announcement, suggesting she will never be extreme enough, and would go on to attack her with a kendo stick from behind. Later in the evening, Raw General Manager Kurt Angle checked in on Bayley to confirm her Women’s Title rematch. Bayley wasn’t satisfied with a straight singles match-up and argued that she wanted a chance to get back at Alexa for all the mockery and pain she’s caused, adding that she is ready to get extreme. Kurt then changed his initial straight wrestling match idea to a kendo stick on a pole match. Extreme Rules takes place live Sunday June 4, 2017 at 8 PM ET on the WWE Network.